When it comes to making efficient use of space in your warehouse, mobile racking is one of the leading options. With this storage system, the racking itself stands on motor-driven wheels which move in rails built into the floor. The rows of racking can then be moved back and forward, forming a very dense storage unit when the racks are together, but also creating an aisle when a certain item is needed. The system is more or less a much larger version of the mobile shelving common in archives and libraries, except here the shelves are not opened manually. 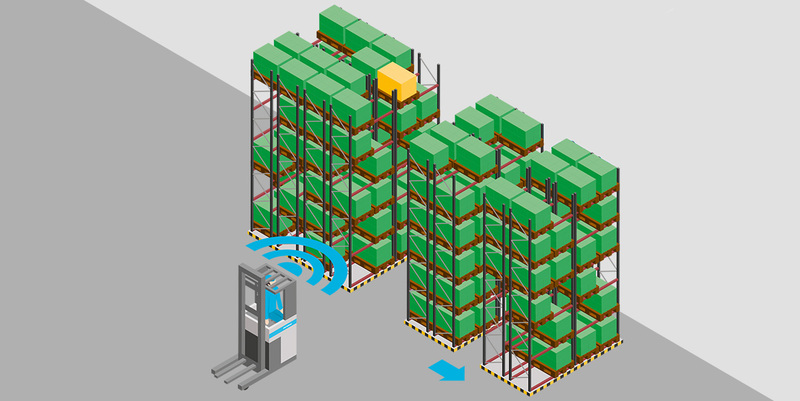 Instead, the driver typically moves the racking via a button system on the racking, or even from the forklift truck. Mobile racking uses floor space very well, and is often used by companies as a space-efficient way of storing those lower-demand items, since the neccessity of moving the racks slows down the put-away and retrieval processes. But this kind of system is expensive to set up and requires quick service in case of a breakdown. However, for many companies, mobile racking is a vital part of their materials handling operation. Boughey Distribution for example, a major British grocery distributor, uses mobile racking at their warehouse complex outside of Nantwich in North West England. Here, UHX and UMS reach trucks do the job of placing and retrieving pallets from the mobile racking. If you want to find out more about mobile racking, as well as other storage systems that may offer quicker access to items, click the blue button below to get our free guide, Warehouse storage systems, explained.